For me the building of Kosovafilm was a, a great motivation and a challenge how to conceptualize the building, because it has some very specific functions. Such as, the sound room which is part of the building, because of the acoustics it is there where the dubbing of the movies takes place, then the cinemas, the warehouses for film preservation, then the administration and the area for socializing. These functions I have accommodated in such a way, so that each has its integrity in regards to… but, again they connect to one another in an organic way. From Kosovafilm you can see the city of Pristina quite well, and I went with the colors of the facade which are ochre, if you recall Kodak that used to produce films, the colors of their packaging were like that… and I made that connection, you know, how I designed the facade I connected it with the purpose of the building. Salih Spahiu was born on January 26, 1946 in Tirana, Albania. He graduated from the Department of Architecture at the University of Sarajevo in 1973. Upon his return to Kosovo, he worked at the Urban Planning Office at the Pristina Municipality. 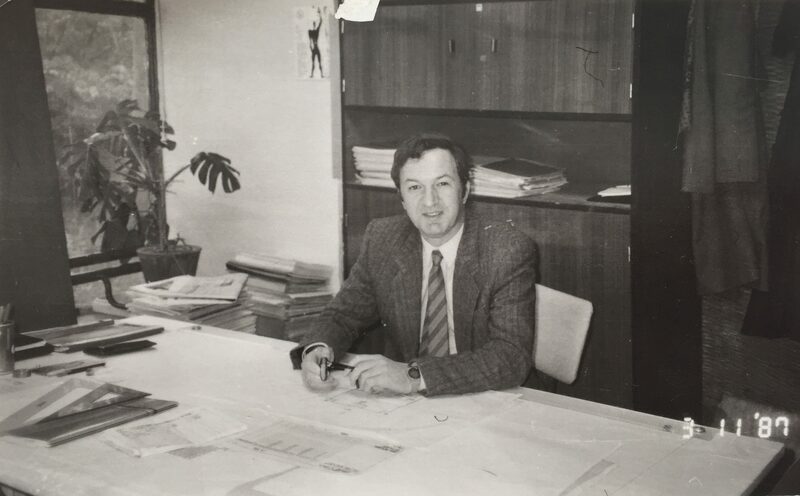 Later in 1975, he started working at the Kosovo Bureau for Urban Planning. Mr. Spahiu has designed many buildings in the city of Pristina, including Kosovafilm and the Shopping Mall in Sunny Hill. Today, he is retired and lives with his family in Pristina. Aurela Kadriu: Mr. Spahiu, can you please introduce yourself and tell us something about your early childhood memory? That is, your family, the place you grew up in, whatever you remember from your childhood. Salih Spahiu: Yes. I was born on January 26, 1946 in Tirana, Albania. I spent a part of my childhood in Prizren, and the other part in Gjakova, until the fourth year of elementary school. Then we moved to Obiliq at my sister’s and brother-in-law’s. My late mother and I lived there because of the difficult material situation that we were in at that time since our father was politically imprisoned in ’45 and executed in ’46 here in Pristina. I was very little, twenty days old when my father left me, I only remember him through photographs. Aurela Kadriu: Can you tell me why were you in Tirana when you were born? Salih Spahiu: I was born in Tirana because my mother had to go there because of health reasons. There were Italian specialists in Tirana. I only stayed there for a few days as a baby, then we moved to Prizren where we also lived for some time. As I already told you, I completed a part of elementary school, until the fourth grade in Gjakova, while the rest until the eighth grade I completed in Obiliq where we also lived together with my brother-in-law and my sister. After the elementary school, I enrolled in the gymnasium of that time called Ivo Lola Ribar. Aurela Kadriu: Can we go back to your early childhood. Can you tell us why was your father sentenced to prison in 1945 and eventually executed? Salih Spahiu: My father was the first leader of the Lëvizja Nacional Demokratike Shqiptare [Albanian National Democratic League] and, together with some other activists of the national cause, they struggled for the issue of Kosovo and that is why the system of that time imprisoned him politically. Maybe it is worth mentioning that he was part of the first delegation who visited Tito and demanded for Kosovo to remain totally independent as a republic, or to unite with Albania. This is the reason why political problems emerged for which he was first sentenced to 21 years in prison, then they changed it and decided to execute him. He was executed on February 16, 1946. At that time, I was only twenty days old, and as I told you earlier, I only remember my father through photographs. He was 49 when he was executed. Aurela Kadriu: Is there any story about your father that was passed on to you by your mother. Is there anything they told you about your father? Salih Spahiu: Yes, together with my paternal uncles, he was a popular trader at that time. They owned the Vëllezërit Spahija [Spahija Brothers] brand in the Northern Albania, but also in other parts of Albania where they worked. And besides trading, they made contributions to the economic development of the region of the Highlands, the so called Gjakova Highland. Then, he also helped the Lëvizja Nacional Çlirimtare [The National Liberation Movement], he wasn’t a member of it, but he supported it financially. But later, he could not agree with the fact that Kosovo remained under the rule of Serbia, and this was the main reason that cost him his life. Aurela Kadriu: You told me earlier that you had four sisters and you were the youngest. How was this kind of life for you as a child? Salih Spahiu: My sisters were…My older sister stopped going to school when she turned sixteen, because my father was in prison while my second and the little sister completed the Shkolla Normale and were education workers. I already told you that I lived in Obiliq, at my second sister’s who together with her husband, worked as a teacher. I spent my childhood there together with my little sister and my mother. From my childhood, I would like to highlight the summer days when I would go to Gjakova at my older sister and brother in law’s, and when I went with my friends and peers to swim in Erenik [River]. Then, some weekends in Deçan. These are some of the childhood days that I remember, that have persisted in my memory because at that time there were no toys and other things that children have nowadays. The only entertainment was playing soccer or when the weather was good, swimming in Erenik, Drini, in Deçan and so on. Aurela Kadriu: Do you remember what kind of city was Gjakova during your childhood? We are talking about the late ‘50s? Aurela Kadriu: What kind of city was it? Salih Spahiu: Gjakova was a small city but with a well established tradition of civilization. There were mostly craftsmen, there was no industry at that time but there was order in the city and the order from the city was also reflected in the families and vice-versa from families, to the city. I mean, the city was clean, small and cute, and I mean this is what I remember from that time. These are things that I remember as something good when I think of Gjakova. Aurela Kadriu: What about Obiliq? I am asking you particularly about Obiliq because somehow, Obiliq is a city that we don’t think much of, simply, the power plants are there and that’s it. What kind of city was it at that time? Salih Spahiu: The construction of the power plants started when I was still in Obiliq, I was in elementary school when the construction of the Power Plant A started. Obiliq was a small town inhabited by people from the working class who worked on the construction of the power plants, life in Obiliq was not that advanced in general. I remember that they had one cinema hall and the elementary school Vellaznimi [Brotherhood], where I completed elementary school, then they had some small shops, it was a very, very small town. The railway connecting Fushë Kosovë with other places in the north of Kosovo was in Obiliq. I mean, it was a city left behind, but life started in Obiliq with the construction of the power plants, life in Obiliq started changing a little but not in the measures that Obiliq deserves as a place that is the source of energy in Kosovo. Aurela Kadriu: Why and how did you decide to go to the Ivo Lola gymnasium in Pristina? Salih Spahiu: When I finished elementary school, I decided to go to gymnasium and at that time, I travelled from Obiliq to Pristina by bus but the buses weren’t so frequent as they are today. I often remember that the bus got stuck in Shkabaj because of the snow and us, the passengers and students had to push it in order for it to start moving again. During gymnasium, I travelled from Obiliq to Pristina and vice-versa every day for three years. I remember that it was very cold and the buses were not frequent. For one year, I stayed at my little sister’s, at that time my brother in law was in Paris for his specialization, so that was the year when I didn’t travel from Obiliq to Pristina. I remember that the criteria in the gymnasium were very strict. I studied natural sciences. We were twenty students in my class, most of them continued their studies after finishing the gymnasium. Most of them have become doctors, engineers, stomatologists and so on. I remember that my class monitor, the late professor Hamdi Spahiu, fought without any compromise with some of my friends who started smoking, and he followed them in every step because he knew about the damage that smoking would cause to their health when they were young, but also when they matured. During gymnasium, we had many extra-curricular activities. I remember that I decided to be part of the activities of the Amateur Club of Photographers and I worked there during my free time for a long time and that is where my love for photography, art and in general things dealing with aesthetics or what we call art, comes from. Aurela Kadriu: Did you own a camera? Salih Spahiu: We didn’t have cameras. We had some photography machines, how to say…that belonged to that time and had very low performance. I remember the photography machine Lajka, which was a very simple product and it had a projector. When we developed photographs, we would lock ourselves in dark and isolated rooms with no windows. I mean, we worked in a very archaic way, but these were the conditions at that time. Aurela Kadriu: I wanted to ask you about something else, from what you are telling me about your childhood, looks like you spent a lot of time with your mother. Can you tell me, how was your mother, what kind of background did she have? Salih Spahiu: My mother was a housewife, but she educated us very well. She was a very wise woman and she commited her life to us since our father left us when we were very little, so she became a father and a mother to us. She was uneducated, but she always advised us to study, to go to school and develop skills that would be helpful for us. She died when she was 66 and I was a student in Sarajevo at the time when she passed away, but even though it was winter, I managed to be on time for her funeral. Aurela Kadriu: I would like to continue from the gymnasium again. Do you want to take some rest? Aurela Kadriu: The time you attended at the gymnasium is also the time when you started frequenting the city of Pristina more, can you tell me about that time, maybe you have memories from the first time you came to Pristina. Can you tell me, what kind of city was it? Salih Spahiu: Yes. Of course, Pristina was a very small city at that time. Of course, it was different from other cities, but it was a very small city, the city was [geographically] expanded, how to illustrate it to you, you know where the Cathedral is now, that is where the city ended. I mean, it was very small but it was obvious that it would develop. Some signals of developments were given, but however, there were very few streets and very few buildings. Later, as you know, the University was established, when the University was established, the spirit changed totally, but this was in the ‘70s when I was outside Pristina, I was a student in Sarajevo. Aurela Kadriu: What about the neighborhood where Sami Frashëri Gymnasium was located, what kind of neighborhood was that? Salih Spahiu: Sami Frashëri Gymnasium was called Ivo Lola Ribar at that time and it was located in how to say, the heart of the old city of Pristina. That part has been conserved partly and partly destroyed. Now, it is totally degraded and doesn’t show any type of continuity, be it historical, architectonic or urbanistic, there are only some fragmentary buildings left. At that time, it was protected as an urban and architectonic totality. Aurela Kadriu: Can you tell us more, maybe you used to hang out there since your school was near, maybe you went out for the long and short breaks, can you tell us about that? Salih Spahiu: Yes, of course we went out during breaks but we also would hang out in the surroundings of the gymnasium, mainly to eat or to buy something. Only when there were organized walks or races by the director of the gymnasium would we usually go to Germia for walks and of course we would walk up there. Gërmia was a place we admired at that time, we still do, but unfortunately it has gone through very bad degradation because of lack of care and good management. Aurela Kadriu: The Gymnasium of Natural Sciences…Were you the first generation attending the divided gymnasium? Salih Spahiu: No, no, there were also generations before mine who…at the time when I was attending the gymnasium, it was divided into the department of Natural Sciences and Social Sciences. Usually, there were fewer students in the department of Natural Sciences, I remember that the Social Sciences one had many more students. But, these two departments of the gymnasium had also existed before my generation. Aurela Kadriu: How was gymnasium for you, the Natural Sciences department? Salih Spahiu: Yes, as I told you earlier, the criteria were very strict in the department of Natural Sciences. We had so many subjects taught in Serbo-Croatian because of the political circumstances of that time in Kosovo, but the criteria were strict and the professors were pretty committed. This speaks to our later results as maturant and excellent students in the gymnasium, but in matura most of the students came out with the highest grades and continued their studies. And as I told you, they became doctors, stomatologists, engineers and other professions that are pretty difficult to study. Aurela Kadriu: How did it happen that you decided to study architecture? Salih Spahiu: I decided to study architecture when I was in the third year of gymnasium. My descriptive geometry professor encouraged me to study architecture and so that is when my interest in it started. I remember that I started browsing the books and find out about various architects and their works. One that impressed me was Le Corbusier who is an architect with Swiss origin, but who lived and worked in France, in Paris. And unfortunately he died because he drowned in the Mediterranean Sea, if I am not mistaken. But his works were an inspiration, his and the works of other great architects were an inspiration for me. But what was interesting was the inspiration and encouragement from my descriptive geometry professor who is of Serbian nationality and whose name I cannot remember at the moment, he would always tell me, “You are going to study architecture!” So, I decided to study architecture in Sarajevo. Aurela Kadriu: How did it happen that you decided to study in Sarajevo? Salih Spahiu: Some of my friends were there and I asked them to give me more information about the situation. There were many students from Kosovo studying in Sarajevo, not only architecture but at the University of Sarajevo in general, so that is why I decided to go there. I think that the Faculty of Architecture in Sarajevo, or as they called it the Urbanistic-Architectonic Faculty, was one of the most famous faculties in former Yugoslavia where experts and famous architecture professors worked, if I can mention them now, some of which have left important marks in architecture, not only that of Bosnia and Herzegovina but also other places of former Yugoslavia. Professor Juraj Lienhard works there, then there is Zlatko Uglin, then Dzemalj Celic, Ivan Taubman, Jail Finci, Zivorad Janković, Milos Sonborci and many others who really maintained a high professional level and were great pedagogists. Aurela Kadriu: In which year did you begin your studies? Aurela Kadriu: How was going to a place like Sarajevo from a childhood between Gjakova, Obiliq and Pristina? Salih Spahiu: Of course, as every beginning, this one wasn’t easy either, but one always prepares for challenges in life. When I went there, I was preoccupied with my studies and had no time to think about other things because the Faculty of Architecture required constant work, there were daily exercises and lectures. I can say that I attended each of them with commitment and this was one of my main preoccupations during the studies. Aurela Kadriu: What kind of city was Sarajevo? Was it developed? Salih Spahiu: Compared to our cities in Kosovo, of course Sarajevo was more developed. Sarajevo is a mixture of Oriental and European architecture. I can say that the mixture was very successful and that is why Sarajevo is one of the most visited cities by tourists. However, back then it didn’t have the contemporary buildings that it has today, but important buildings of social, public, cultural and collective life started back then. The sports and recreation center Skenderija was built in Sarajevo as well at the time when I was still a student. The chief architect of it is the late professor Zvorad Janković, who later on worked in Pristina as well. He worked on the Boro and Ramiz palace, the well-known Boro and Ramiz palace, the current Youth Palace, then on the Vojvodina center in Novi Sad, which was built at the time when the world championship in tennis took place there. Then he worked on Gripe of Split and many other buildings of the how to say, capital nature of that time and of this time. Professor Janković was one of the greatest architects in former Yugoslavia and there are many buildings that he projected in Bosnia but also in other places of former Yugoslavia. Aurela Kadriu: How was it for you when you found out that your professor was building [had projected] the Youth Palace? Salih Spahiu: There was an open call for the Youth and Sports Palace at that time. I remember it very well that many other companies from Belgrade and Zagreb applied as well, I mean, I don’t know whether I remember it very well or not but they got the first prize. That was the time when I had just started working in Pristina and I sent them a congratulation telegram. They felt really good when the news that they won the project for the Youth and Sports Palace was published. The Youth and Sports Palace as you know is a very big complex with various contents. Besides that, it has to do with the sports, cultural and economic life, that is, it is a multifunctional building. As you know, the building wasn’t finished. After the palace, right next to the universal hall was supposed to be a closed pool with some open air sports terrains and a part that connects the plato of the Youth Palace with the Arbëria neighborhood. I believe one day they will be built too. As for the pool, you know that Pristina really needs a closed pool. There is the documentation of the technical project, the finished project exists and I am sure that the Municipal Assembly waits for the funds to be able to start building the closed pool within the complex. Salih Spahiu: No, I am referring to its function. That is, within this building there sports life takes place, sports life can and is taking place. There are two halls, one of them is small and the other is big and universal. Then there is the other part of the Youth Palace where cultural life can take place; various exhibitions, lectures and then concerts. Then there is the economic part, the part where the shops are located for trading. I mean, three fundamental functions are integrated in a totality, and the pool would be as a fourth function within the sports, but it would be a closure of the complex as an architectonic totality with multifunctional contents. Aurela Kadriu: And as a style? Besides its function, I am interested to find out what does the Youth Palace represent to you as a style today? As an architectural style? Salih Spahiu: Yes. Of course, the Youth and Sports Palace was projected following the spirit of the time and today it is a mirror showing how that time was and the architecture of that time in general. The contemporary trends of that time. However, I can say that to this day, it represents a dignified building in the architectonic sense of the word and its layers speak about its content and function. Aurela Kadriu: Let’s go back to your studies, because I just wanted to stop since you mentioned the Youth Palace. Let’s go back to your studies, can you tell me how was the student life in Sarajevo? I mean, everything that represented the student life. Earlier you mentioned an association that Albanian students had there. How was it manifested? What do you remember from this life in Sarajevo? Salih Spahiu: Student life in Sarajevo was more lively than that in Pristina because of the tradition of the faculty, but also of student life in general. If we talk about extra-curricular activities, I would mention activities that took place at that time. I remember that we organized the 500th death anniversary of Skanderbeg within the Lulëzimi [The Blooming] Club, which was the club of Albanian students in Sarajeva, comprising mainly of students from Kosovo, of Albanians. It was a high level ceremony in which students from the Përpjekja [The Struggle] association in Belgrade and Shkëndija [The Sparkle] association in Zagreb took part. A delegation from Kosovo attended the ceremony as well as many personalities of public life in Herzegovina and Albanians who lived in Sarajevo. The ceremony became so famous, the media paid special attention to it and so the role and the struggle of Skandërbeg from the time he fought and gave his contribution, were affirmed. This was it. Since there were so many Albanians in Sarajevo, besides the Lulëzimi club, there was established another Albanians’ club called Valon Curri. The role of this club was to bring Albanians together and develop a cultural life. There was the press and the club’s library where Albanians could spend their free time. This was all in the name of advancing the life of Albanians in Bosnia and Herzegovina, national equality….The leadership of Bosnia and Herzegovina paid special attention to national equality and Albanian communities in Sarajevo. I remember from that time that there was an Albanian TV show broadcasted on Radio Sarajevo, it mainly broadcasted news concerning Albanians and the work of Albanians all around the world. Aurela Kadriu: When you decided to study architecture, what was your vision of what you would do with that diploma? Why did you make that decision? Salih Spahiu: Except being a profession, architecture is also a mission, a very important mission in one’s life. To project a building means to determine the fortune of those using it, starting from the hospital where a child is born to the kindergarten where pre-school starts, then school, university, work and other activities of cultural life, entertainment and so on. After medicine, I believe that architecture is one of the most important missions and one of the most important professions serving humankind. This was one of my motives for deciding to study architecture, the second was that there were very few architects in Kosovo. The first Albanian architect, as you know, was the late professor Bashkim Fehmiu who died around ten years ago. He was the first Albanian architect, that is, Kosovo had no architects until ’58. Projects that were built in Kosovo, were mainly made outside Kosovo. Professor Bashkim Fehmiu brought a new spirit, it is true that later he was joined by some other colleagues, but they were very few. The Faculty of Architecture in Kosovo, respectively in Pristina, started working in ’78-’79, it was the last one. Now there are enough architects but, how to say, the situation is not that good. I believe this is connected with how the ruling power and laws affect the orientation of urban and architectonic development, I mean the respect and the lack of respect towards the law is reflected in the space. Here, it is unfortunately reflected negatively, and the main responsibility for this lays at the central and local power. Aurela Kadriu: When you mention Professor Fehmiu, I know that you were very close with him. Can you tell me, when did you become friends with him? Salih Spahiu: I met Professor Bashkim right after I graduated, in ’73. But, I had met him several times, recently, after the war he was engaged in our project at the Bureau for Urbanism and Projecting for the Memorial Complex of Adem Jashari in Prekaz. At that time, the professor established his team of various experts coming from inside the Bureau and outside of it. Aurela Kadriu: In which year? Salih Spahiu: Right after the war, in ’99, I mean, ’99-2000. He worked on the design of the projecting task and urbanistical plan for the Adem Jashari complex in Prekaz. At that time, I got the chance to spend so many hours with him. We talked many times about various issues, Professor was a very knowledgeable human, he had general knowledge about every field, not only architecture. He was someone who had travelled a lot around the world, met famous architects of 20th century, he met LE Corbusier, Veralto, Pier Luigi and so on. And of course, he took elements from them which he later applied in the practical life in Kosovo and Pristina. He mainly worked in Pristina but he also made a valuable contribution to the architecture and urbanism of Kosovo. I remember his saying “Life is space and space is life.” Life and space are two inseparable elements. Through his projects, the professor paid special attention to the human life. Through urbanism and spatial planning, he tried to make the human life as dignified as possible, in the physiological sense as well as the psychological one. Aurela Kadriu: In which year did you finish your studies in architecture? Salih Spahiu: I finished my studies in 1973, in June, 1973 and then I started working at the bureau of Ramiz Sadik, at the Industrial Construction Combine, the so-called Industrial Construction Combine Ramiz Sadiku. I worked there for a few months, then by the invitation of my friend Rexhep Luci I started working at the Urbanistic Bureau of the City of Pristina. Aurela Kadriu: I have one last question about your studies then we can go on to your professional life. What was your graduation thesis? Did you have a graduation thesis? Salih Spahiu: Yes, we did. I finished my studies in June, 1973. I graduated with excellent success, the late architect and professor Zivorad Janković was my mentor. My graduation thesis was in Sarajevo. It was a complex between a few streets, a complex where business buildings and a cinema hall had to be built. The commission and the professor gave it high marks. After my studies, I started working for the Projection Bureau of the Industrial Construction Combine Ramiz Sadiku, of course in the beginning only as a collaborator, co-designer. I had older colleagues who led the project and I was their collaborator. In 1974, the late architect Rexhep Luci invited me to start working for the Urbanistic Bureau of the City of Pristina. I accepted his invitation because I found it interesting to also deal with urbanism, I started working for the Urbanistic Bureau of the City of Pristina together with the late architect Viktor Shiroka and Esat Meka, also an architect, and some other engineers, we worked several urbanistic plans for the city of Pristina. In 1975, I started working for the Urbanism and Projection Bureau of Kosovo, that is how it was known back then, of Kosovo, and I worked there until my retirement in 2011, for a very long time. Aurela Kadriu: Can we talk more about the Urbanistic Bureau of Pristina, of the Municipality of Pristina. What kind of projects did you work on at that time? Salih Spahiu: When I was there, we worked on something in the completion of the urbanistic plan of Ulpiana, then we also worked in these buildings that you are in now and that are now called Qafa, I mean, we worked on it urbanistically. We worked on other plans of the local level that were important to that time, but at that time we also searched for different locations for various buildings that were important for that time. The project of the revitalization and conversation of the old Çarshia was also made at that time, my colleague Esat Meka worked on it. I am talking about the old Çarshia of Pristina. But unfortunately, many projects remained unrealized because of various political, economic and cultural reasons. Architecture and urbanism require willingness and good political support in order for things to move forward. We didn’t always receive that here. Aurela Kadriu: When was the primary plan of Ulpiana made, since you said that you finalized it? Salih Spahiu: The primary plan of Ulpiana was made in the ‘60s but we completed it with a few buildings. The Srem street as it was called back then, now it is called George Bush, if I am not mistaken, near the Faculty of Philosophy. We worked there and we also worked in some other buildings when there were special opportunities to add more buildings. When we speak about Ulpiana, I must say that to me, Ulpiana represents one of the most successful neighborhoods of the city. Ulpiana, Dardania and Kodra e Diellit [Sunny Hill]. I mention this because nowadays a lot is talked about European norms and standards, I don’t agree with that at all. We can say that progress has been made when it comes to [construction] materials, but as far as concept goes, I can say that the new neighborhoods are far more behind than Ulpiana, Kodra e Diellit and so on. I can mention here some neighborhoods in Pristina which you know very well, for example the neighborhood near Hotel Sirius, behind it, you have seen how the situation is there in the urbanistic sense. One does not have to be an architect or an urbanist in order to be able to assess that. Then Kalabria, Mat…There are several neighborhoods that are a great urbanistic failure. Of course, the architects who didn’t raise their voices as much as they should’ve about the situation in the city of Pristina and in Kosovo in general are also responsible. When I was working for the Bureau of Urbanism and Projecting which was later called the Bureau for Conclusion and Engineering, I worked on different projects of different nature and destination. I would like to mention the buildings of the Post and Telecommunications in Vushtrri, Kaçanik, Viti and Dragash. Then the building of Kosova Film for which I was also awarded with the first prize of the Kosovo Association of Applicative Artists and later on I also received the Borba Award for Architecture in Kosovo when the building was finished. Of course, I also competed with other buildings in the federative level of former Yugoslavia, I received this award in 1988. Later on, I received an award for creativity from the back then Kosovo BVI of Culture. I can say that I projected the building of Kosova Film thanks to our late writer Azem Shkreli who was the director of Kosova Film and thanks to the director of the Bureau of Engineers, the late Vehbi Orana, I received great support of both of them during the whole process. The building has its own specifics, but as you know, currently the headquarters of KFOR for Kosovo are situated in the building of Kosova Film. Aurela Kadriu: We will return to Kosova Film again, and I would also like to talk about the building of the shopping mall. But I wanted to ask you about Dardania, Kodra e Diellit and Ulpiana. Ulpiana is older, in the ‘60s, but Dardania and Kodra e Diellit are somehow neighborhoods that mark the beginnings of collective inhabiting in Pristina, besides Ulpiana. Were you part of the working group in the process of planning these neighborhoods? Salih Spahiu: No I wasn’t, because as you know Dardania was projected in Zagreb by authors from Zagreb, I have had the chance to meet them, Dardania was projected in the ‘70s. But, I think that in the urbanistic sense, it is a successful neighborhood and when we look at the time distance, Ulpiana as well as Kodra e Diellit and Dardania were urbanistically designed in Zagreb. Then the buildings were mainly designed outside Kosovo, mainly in Belgrade and Zagreb, most of the buildings. The shopping mall located in Kodra e Diellit is a project of myself and my colleague Hamdi Binakaj. We were ranked first from the open call for that buildings. In the context there were many different offices from Belgrade, Zagreb and Skopje but we were trusted to design the main building. Unfortunately, the building faced many shortages during construction because it was constructed right after the war and those who currently use the building with their work have contributed to the worsening of its condition and looks. For example, the terraces of the coffee shops and so on are improvisation that were made later and weren’t part of our project. Another floor was added because the investor invested because the building was lower. An annex project was added to the part of the building that is facing the main road…So, there were some changes in the architectonic sense of the word compared to the way we made it. But those changes only affected negatively the whole concept which we imagined when we worked on the initial project for the open call. Aurela Kadriu: When the call was opened, what was the vision of designing a shopping mall, what was the vision of the call but also yours when you designed it? What did you want to do through that shopping mall, what did you want to bring to the city through it? Salih Spahiu: Every call aims to get the best architectonic and functional solution, this was the goal of that call too. The projecting task came from the needs of the trading network of that time in Pristina. Of course, Gërmia and Vocari bought the building. First they were interested in opening their shops there and compare their products with those who were part of their trading network. Later after the war, some changes were made as I told you earlier, some changes were made that only worsened, how to say, the concept. They degraded the initial concept of the shopping mall. The shopping mall is situated exactly where it was supposed to be according to urbanists. The location of the shopping mall is exactly where the urban planning of Kodra e Diellit has designed it to be. Of course, the layers and patterns are a result of what we worked on later as an concept idea, but later also as a main concept, but we always based our work on what was required by the detailed urban plan of the neighborhood of Kodra e Diellit. Aurela Kadriu: I find the color very interesting and some…I always thought about some aesthetic decisions in that building. Can you tell me about that part? The thought process before designing it? Salih Spahiu: As you know, shopping malls are mainly pretty isolated buildings because of their destination and because the space should be used maximally. We wanted the natural light to dominate, as you know and see, there are lightning lines but in the zenital overview, as we call it, they go through the communicative parts of the building and indirectly light the shops and other parts of the building. The facade is a modicular and industrial one, as it is usually in this kind of buildings, how to say…The closed part of the façade dominates in this kind of buildings, which gives you space to play with layers, which are a result of plastic which we wanted to achieve in the whole building. Since the building is very high, some avoidances were made in the façade as well as in its layers, some avoidances which make you lose the sense of the height in the visual aspect, the height of the building. The building is around 136 meters high if I am not mistaken. Aurela Kadriu: In which year was it completed? Salih Spahiu: The building was completed in ’87. We won the competition in ’87, then we made the main project and the inauguration took place in 2001, right after the war, in 2001. Aurela Kadriu: Did it ever manage to have the same function before the war, even if minimally? Salih Spahiu: The building wasn’t complete before the war. Aurela Kadriu: And it was also not used? Salih Spahiu: It wasn’t used. It was complete in 2001, right after the war. It was completed by the Pristina Housing Enterprise and some changes were made without our consent and of course they degraded the initial concept. But nobody takes responsibility for that here in Kosovo. In Kosovo, the author is not valued enough. Aurela Kadriu: Was there any calls for Kosova Film? Salih Spahiu: No. I won the project for Kosova Film thanks to my professional references, I mean, I was entrusted with the project by Azem Shkreli, the former director of Kosova Film and from inside the Bureau, I was given the project by the director Vehbi Orana. I believe that I finished the project. The project and the construction were successfully finished, that is why I also received some awards which I told you earlier about it. So, the building was how to say, previously ordered, there was no call. This was a project ordered by the investor, and the investors themselves picked me to do it. Aurela Kadriu: What was the vision? I would really like to know because earlier you mentioned that putting a building on a certain space, determines the lives of the people. That is why I am interested to know the vision behind putting these buildings on the space. The vision of Kosova Film in that space, but also what did Kosova Film aim to bring by existing there? Salih Spahiu: As you know, Kosova Film is a sole building in that space, it was sole at that time…It is exactly that fact and the land’s configuration that were inspiring elements for me to make such a concept. The building was pretty long treated in the sense of its functions and specific technology that this kind of buildings have, and since it was lonely, I went with long layers and a gradation that is compatible with the ground, with the location of the building itself. That is the first time I used the so called lanterns or lightning lines, then I also used them in the shopping center together with the colleague that I mentioned, Hamdi. The building of Kosova Film was motivating but also challenging to be concepted because of its very particular functions. Such as the sound hall that is part of the building because of the acoustic conditions in which the synchronizing of the films is done, then there were the cinemas, the magazine where film reels were kept, then the administrative and social part. I merged all those functions and made it possible for each of them to have their own integrity in the sense of…but again, they connect to each other very organically. You can beautifully see the city of Pristina from the building of Kosova Film, and I decided to use ochre in the façade, if you remember Kodak that produced film reels, its package was…And I connected the destination of the building with the façade color. Façade is made out of armored polyester which is a material that wasn’t used in Kosovo up to then, it was first used in this building. I had first seen it in Slovenia, in Ljubljana, and I immediately got in touch with the producers of that material. I gave the modul and the form of the façade and they did other elements. They worked on other elements of the façade. The whole façade is air conditioned, it is a modular façade that was put in a metallic net that was previously put in the outer walls of the building. Salih Spahiu: No, that was not its initial color. The current color is a decision of the investor, without consulting us. Salih Spahiu: Yes, exactly like that. But the investor brought those floor ceramics and put them without asking us. It must’ve been because of the price or some other reason, I don’t know. What I want to say is that authors face various problems in Kosovo, because the authorship is not valued enough. Salih Spahiu: I forgot to tell you something else about Kosova Film, the background of the Kosova Film is full of green pines and the fact that I decided to pick that color was strongly connected to the function of the object but it also corresponded so well with the green background and the building could be viewed by so many points in the city. The color would pick one’s eye from many points of the city, the point was to give it a color that corresponds with the function of the building but also so the building could be viewed by many points of the city. Aurela Kadriu: What about the shopping mall, why did you decide to give it the color of the dust? Aurela Kadriu: Was that the color that you imagined? Salih Spahiu: Yes. Many things were respected inside when it comes to colors, but our decisions weren’t respected when it comes to function. Aurela Kadriu: Is that the color that was supposed to be used outside as well? Salih Spahiu: No, the one that was supposed to be used outside was different, it was a chocolate color, cocoa, it had nuances that showed the plastic of the building and that would not make you lose the sense of the height of the building. Salih Spahiu: Yes. As architecture students, we went to Italy when we were in the senior year, when we were seniors. We visited some buildings and famous centers for the history of architecture such as Venecia, Fireze, Rome, Padova and so on. That was an excursion organized by the University and during that trip that lasted for ten days we spent some days with our professors. Of course, at that time, the professors who were with us spoke about the development of the cities in Italy and the architecture of the time when it was constructed and so on. Besides Italy, we often went to the Adriatic Riviera to see the hotels, that was in the subject of Hotel and Social and Public Buildings Design…During that time we visited some buildings especially in the countryside of Dubrovnik, that is, these were professional trips, the professor or the teaching assistant of the subject would always join us and talk to us about the functions. This is how the practical and theoretical sides were completed, we also saw in Prague how a hotel looks for example and its functions, how they are determined and so on. We connected that with what we learned during our studies. Salih Spahiu: Yes, in ’73. Aurela Kadriu: In ’73, yes. I would like to know what was the architectural trend at that time? Each period is characterized by a certain architectural trend? What did you like? What kind of style? Salih Spahiu: Look, I learned many things from my late professors. Of course, at that time there were some great architects of contemporary architecture who left their eternal marks on the modern architecture such as Le Corbusier, Alvar Aalto, Wright, Mies Van der Roe, Kenzo Tange, Pier Aalto for example, because Wright was based on traditional architecture. Wright is especially known for his organic architecture, he left unique buildings behind him. Alvar Aalto is Finnish, he left some buildings of Finnish tradition. Kenzo Tange is Japanese who worked in the spirit of traditional japanese architecture, but with contemporary elements. Le Corbusier mainly followed the modern style. Oscar Niemeyer, I forgot to mention him, he is an architect from Brazil who designed many buildings in the new city, in the new capital of Brazil. He follows a contemporary architecture and is inspired by Le Corbusier, they also collaborated many times. Pier Luigi Nervi is a civil engineer but he made some unique sports halls around Rome. So, in general, influenced…I was influenced by these architects besides my late professors. My professors always spoke about how things should be analysed prior to starting the design. I always followed that advice, I mean, a decent analysis should be made, an analysis of location, weather, other conditions such as traffic and so on, before the designing begins. I mean, an architect should not immediately take the pen and start designing, they should analyze the context in which the building should be constructed and its function. Then, other things flow easier and the result is better and many times positive or very positive. Aurela Kadriu: Do you remember, you were close with Bashkim Fehmiu, do you remember Grand Hotel, the time when it was designed and constructed? Salih Spahiu: Yes. Professor Bashkim Fehmiu is the author of the urbanistic solution of that part, but also the author of the project. In his project idea but also in the main projet, he worked together with an architect from Belgrade whose name was Dragan Kovačević. Grand was designed in the ‘70s. It is a very well-concepted building and it marks the end of the street that is now called Mother Teresa street…I mean, it is in line with other buildings of the Mother Teresa street. The building was a very high level building for the time when it was constructed, but recently, as you know….As many other buildings in Pristina have degraded, Grandi was especially degraded, there is a part where they have added a façade which I call the industrial façade, not it looks like a conserve. Other buildings that have faced changes are the Press Palace [Rilindja], the former Press Palace, it has changed totally. When the author came here, he didn’t recognize…Imagine, he almost didn’t recognize his own building. Aurela Kadriu: When was he here? Aurela Kadriu: Yes, but I mean, when was the author here? Salih Spahiu: The author was here around three years ago, maybe two, no three years ago. George Konstantinovski, one of the most famous architects of Macedonia who completed one part of his education in the United States of America. He has some unique and very good buildings in the architectonic sense of the time, the so-called brutalist architecture. There are student dormitories in Skopje, then the Museum of Contemporary Arts, there are also some other buildings that were buildings of a really high architectonic level of that time. He is one of the authors of the former Press Palace. The Tower of the Press Palace used to be completely different, if you remember it. Now it has an industrial façade and the view of the building has been completely changed and of course the professor reacted. The same thing happened to the former Hotel Božur, then with EximKos, I mean some things have been done in the architectonic sense…in a setting where architecture and architectonic continuity is valued, these things would not happen. Aurela Kadriu: Most certainly, with a more focused attention, since you are an architect, I think you must remember the transition of the city…A pretty chaotic transition from the oriental, Ottoman style to the modern style and what we have today, I don’t know how to call it, this chaos. Can you maybe tell us from your perspective, from your personal memories, how did this transition of the city take place? Salih Spahiu: I cannot brag much about the current situation in Pristina and Kosovo, there is a diversity of construction and there are constructions in urbanism because spatial planning begins from urbanism and everything else begins from urbanism. Architectonic planning is a phase that comes later. New neighborhoods, I told you earlier that new neighborhoods show an extreme urban degradation. I am not talking about buildings of sustainable and beautiful, good architecture. There are materials nowadays, it is much easier for architects to work because a diversity of materials allows you more creativity, but there are evident problems when we compare it with previous times. There are evident problems for my opinion because people often say and lean on European norms and standards which I priori considered as baseless arguments, because if this is how Europe works, then poor them. I mean, some things have been done without respecting the fundamental elements of urbanism such as light, sun and quietness. Many buildings nowadays are very close to each other and don’t have enough light. Then, in many of the neighborhoods of the city firetrucks cannot pass, this is unimaginable. Or buildings are located that way that they don’t provide order and space. I mean, they give you an impression of a chaotic situation, exactly how you called it. As far as the earlier times go, some demolitions took place that should have never happened, but they were made at the time when it was thought that the new replaces the old. That is what led to a deregulation of a spacial and urbanistic continuation. The demolishing trend has continued at that time and is still continuing nowadays in another way. Much is being constructed nowadays, but not the way it should. Aurela Kadriu: What was your position at the Bureau until 2011? Salih Spahiu: For a long time until just before the war, I worked as a designer, I led the Design Office, a smaller unit, the Design Office, because this is how the work was organized in many Design Offices. Then after the war, I was the director, but not out of my will but thanks to the insisting of my colleagues who were employed there. Since our directors left the Bureau, I was forced to take the position. I tried, even though that wasn’t my profession, to honour my work. I tried to start working as soon as possible after the war and reach a decent professional level. Aurela Kadriu: How was your work translated after the war? I mean, I know that right after the war you were focused on renovation and revitalization of buildings, but what happened after? Let’s talk about 2005-2011, how was your work translated then? What did you do? Salih Spahiu: Yes. After the war, I told you that I paid most of my attention to the reorganizing and organizing of the work in the Bureau, because the Bureau for which I worked also had employees of other nationalities. So, some improvements and changes had to be made in the aspect of designing and designing technology, also some improvements in the staff so that the process of designing would go right. So, at that time, I had to recruit new staff of different profiles in order for the network of designers to be in order the way it should, and this way I think we managed to do a good job and we managed to provide a continuity of the fundamental activities of the Bureau. At that time we also collaborated and worked with many organizations outside Kosovo who came here with humanitarian aids and materials, I believe we did that with a decent professional level. Aurela Kadriu: What happens to Pristina right after the war in the urban sense? Salih Spahiu: Yes, urbanistically, Pristina has experienced a great urbanistic and architectural chaos after the war. This comes more as a result of the lack of civil awareness, then also because of the laws because the application of the laws doesn’t…I mean, the laws we had at that time weren’t respected. So, many changes have happened and constructions that we refer to as informal constructions have taken place. Of course these constructions come with long-time, unimaginable consequences not only for our generation but also for the generations after us and for the future of the city. I mean, big urbanistic failures have taken place, ones that can hardly be corrected even with a very large amount of money. They have come as a result of the lack of awareness and as a result of greediness for profit, often underserved profit. Here, there are big failures, especially in the sense of practicing the law. We have enough laws, but we don’t practice them. Aurela Kadriu: What have you continued doing after the retirement? Salih Spahiu: I have continued working in my profession, of course not where I used to, but for another studio, the studio called Studio 39. I worked with my architect colleague Mithat Hetemi and my daughter Linda who is also an architect, and also with some other colleagues who joined us for certain projects. But mainly we were there constantly and we worked on different projects, for different clients of course since the circumstances changed. Maybe the buildings of “Lesna” are worth mentioning, we designed the complex of housing and afarist buildings. Then the Lesna shopping mall, the dentistry clinic of Doctor Ngadhnjim Domi. Then some buildings of individual housing in Pristina and other places of Kosovo. Then the House of Kosovar-Norwegian Friendship in Restelica, a mountain house. Then we also designed the building of the International Village, the Building of Administration, a part of which was a commercial building. Then we also worked on the reconstruction of the building of KOSTT, the reconstruction of the building of KOSTT and some other buildings that I am not going to mention right now, but there are many others. I mean, I have been working all the time as a designer, as an architect designer. Salih Spahiu: In 1978-79 when the Faculty of Architecture started working, I worked there for some time at the Department of Design as a teaching assistant, then I worked there in ’86-’97 again…because at that time there were very few architects in Kosovo, very, very few. I mean that came as a result of the needs for architects in the country level. Here in the faculty some of my other colleagues were engaged, we worked there even after our work schedule because at the same time we were working for the Bureau for Urbanism and Design. It was a good experience, a very good experience, I worked together with a professor from Belgrade who taught Basis of Design. Then I also worked with a professor from Sarajevo, later in ’85…’86-’87, again in the Department of Design. Aurela Kadriu: Can you also tell us the story of the book for Straus? Salih Spahiu: Yes, yes. When the book of the academic architect Ivan Straus for the development of architecture of 1945-1990 was published, he sent me a letter to send him photographs of the building of Kosova Film. As authors from Kosovo, we were represented with the project of Kosova Film in this book that was published in Svjetlost of Sarajevo. Ilir Gjinolli and Lulzim Kabashi did the same thing later with their book, Modernizmi në Kosovë, një abetare e arkitekturës [Modernism in Kosovo, an Architectural Primer]. I was also represented with the project of Kosova Film in the book of my colleague Ilir. This was a respect paid to my work and I think a decent presentation of my work with one of the buildings that I have designed earlier. I can say that luckily, most of the buildings that I have designed have been realized but there are many projects that have remained unrealized as it usually happens in life. Aurela Kadriu: Can you tell me a little about the part where you were a member of the Architects’ Association and what was the field of work of the association? Aurela Kadriu: Until when were you the chairman? Aurela Kadriu: Would you like to add anything? Salih Spahiu: I can add something about Professor Bashkim. I would say that Professor Bashkim dedicated his life to architecture and urbanism. I mean, architecture and urbanism were his life missions and he made a great contribution as the first architect of Kosovo, he made a great contribution even in the founding of many important institutions of urbanism and architecture in Kosovo. Professor Bashkim has left works that can be considered monumental in architecture, theoretical as well as practical. He was a pedagogist at the University of Pristina for many years. Generations after generations were his students. He made a valuable contribution to Kosovo’s architecture and urbanism. Aurela Kadriu: Which buildings did he design, besides Grand [Hotel]? Aurela Kadriu: The current one? Aurela Kadriu: Was the campus his idea as well? The university campus? Salih Spahiu: The professor worked on many important programs, important programs of Pristina and Kosovo. One of his capital projects is of course the Students’ Center with the buildings of the faculties. He worked in the urbanistic and architectonic project idea for the Students’ Center. I mean, I am speaking about the faculties. But I think he also designed urbanistically the location where the campus of the dormitories. Then Ulpiana in the urbanistic aspect, he made the program for the neighborhood of Ulpiana. He worked the program for the Youth and Sports Palace, for the Press Palace and many other capital or unique buildings for the needs of the city of Pristina. He was one of the founders of the Urbanistic Bureau of the Municipality of Pristina, then he was the initiator of the establishment of the Bureau for Urbanism and Design, where I worked from ’75, and other institutions. I mean, he made a great contribution to the fields of urbanism and architecture, but also to the field of pedagogy. When we speak about construction in Pristina or in Kosovo in general, I would like to quote an old Chinese builder, of the 12th century, his name is Kublai Khan who says, “Before a good construction, one should start with a good concept.” With this, I would like to say that in many things we lack precisely that, a good concept. I mean, we are doing many things ad-hoc. When we speak about the new Pristina, we think about some areas in the countryside which are being advertised as the new city, for example the part where the Justice Palace is located now, that is the new Pristina, it is called like that with the perspective that the new city should be built there. If you go and look ar the ground there, there are private houses that have been built according to the land that people owned and the material conditions in which they were. I mean, those in power should put some limitations on what people are allowed to do and what not. If you climb to the upper floor of the building of Gorenje, you will be able to see what we have done to this city, as far as the countryside goes. Here in the center we have high buildings upon which we can climb and see what Pristina looks like today when it could…because Pristina is a relatively new city, relatively new city and the right urbanistic rules, standards and norms could be applied instead of constructing and constructing without a good concept, as Kublai Khan said in the 12th century. I wanted to add something more…Yes, the city is a project that begins at a certain time once and never ends. It is an ongoing project. I mean, the city is an ongoing project. It requires maximum care by its inhabitants but also by those in power. I mean, it is an unfinished project, it is how to say, a project that requires decent maintenance from those who use the space of the city. This is very important to know for the further development of our cities. They are unfinished projects that require a good continuity in the spacial, urbanistic and architectonic aspect.